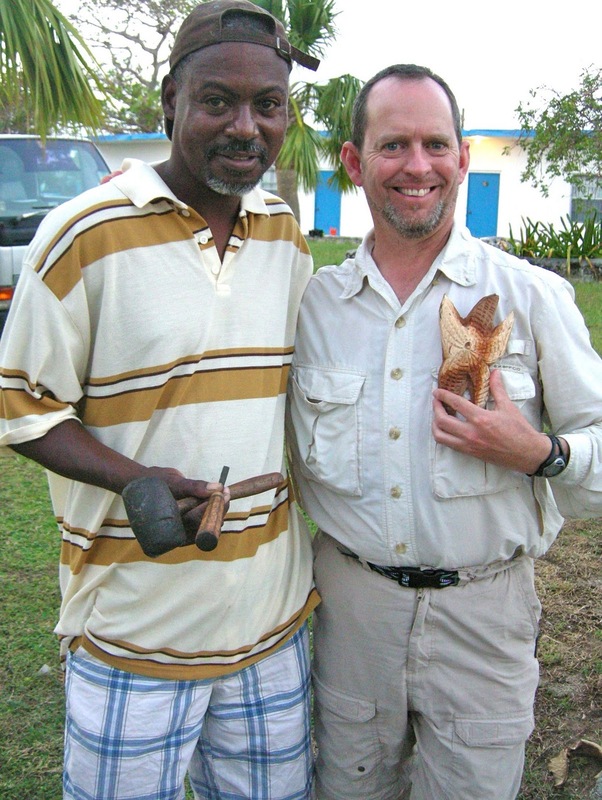 Kenny Whitfield, a Bahamian wood carver, was born in 1964 on San Salvador in the Sugarloaf community. 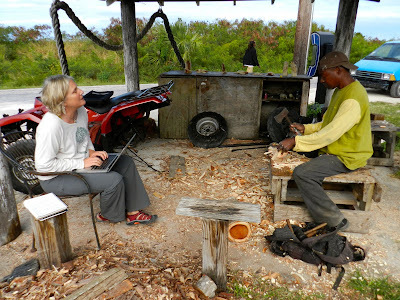 It is the beginning of January 2012, and my Chiboogamoo and I are sitting with him at his carving station out in front of his Sugarloaf home situated on the main road that loops around the island of San Salvador. We have almost missed him on this small island absent of traffic lights and without one stop sign. Things move differently on “island time,” and when I had asked to schedule an appointed time to interview him, he had insisted that we come see him at his open air studio “whenever.” This request had made my task of interviewing him slightly difficult for several reasons (*which you can see at the end of this interview). OPEN AIR STUDIO. 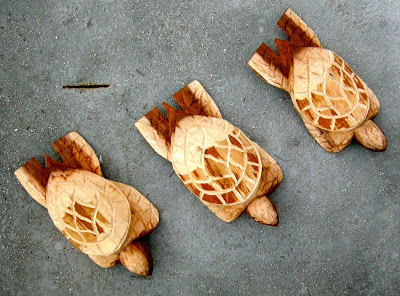 Kenny Whitfield carves his animal figures on the main road of San Salvador. Field station students, professors, and researchers stop by to buy this master wood carver's work. Notice the national fish of the Bahamas painted on his booth. 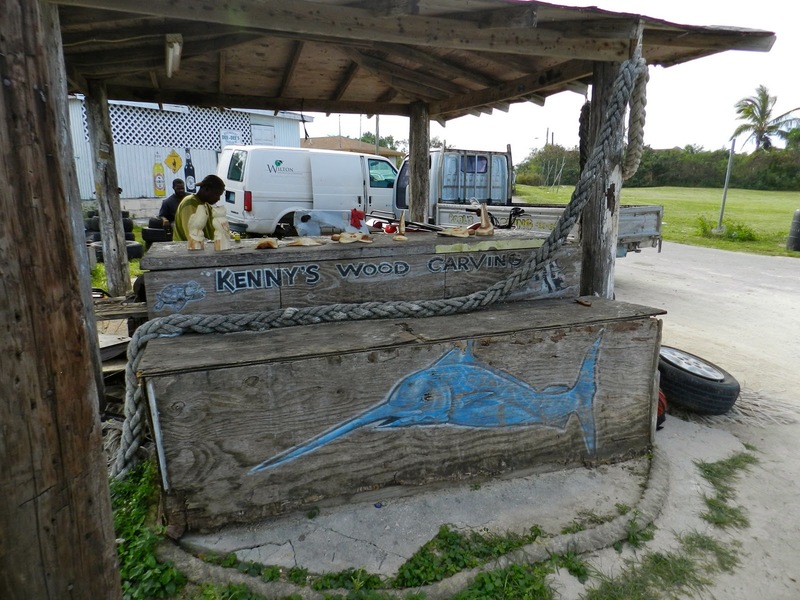 Kenny often carves a blue marlin. It is the morning of January 5th, and my husband and I have swung around the south end of the island in hopes of finding Kenny after dropping off two Emory University students to work on their class project at Pigeon Creek. To our disappointment, the master wood carver of San Salvador was not present at his carving stand, which hosted a variety of carved turtles, fish, and birds. Someone came out to assist us if we wanted to buy a carving but could not tell us where Kenny was. We drove off knowing with just two days left on the island, I might not get a chance to talk with this San Salvadoran artist. HALLLELUJAH TRUTH: How did you get started as a wood carver? 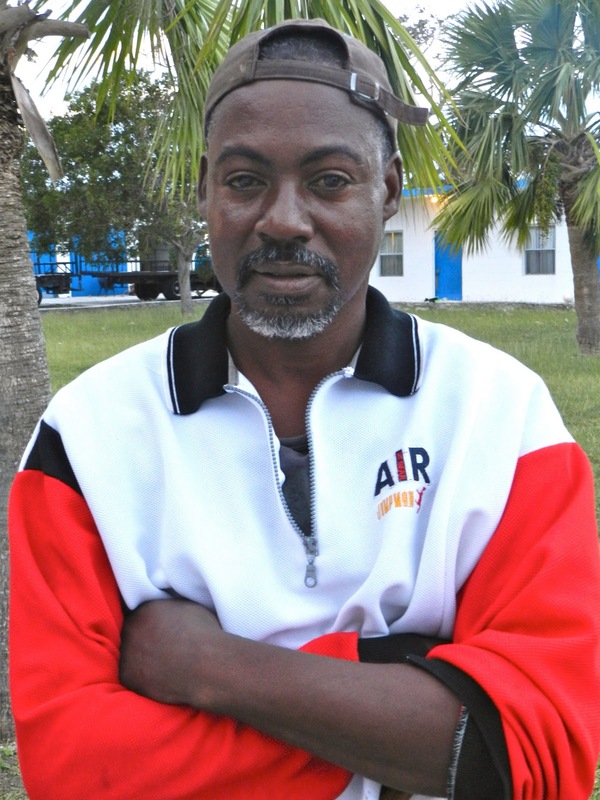 KENNY WHITFIELD: I grew up on the island, left for Nassau to find work, and then returned back home to San Salvador. 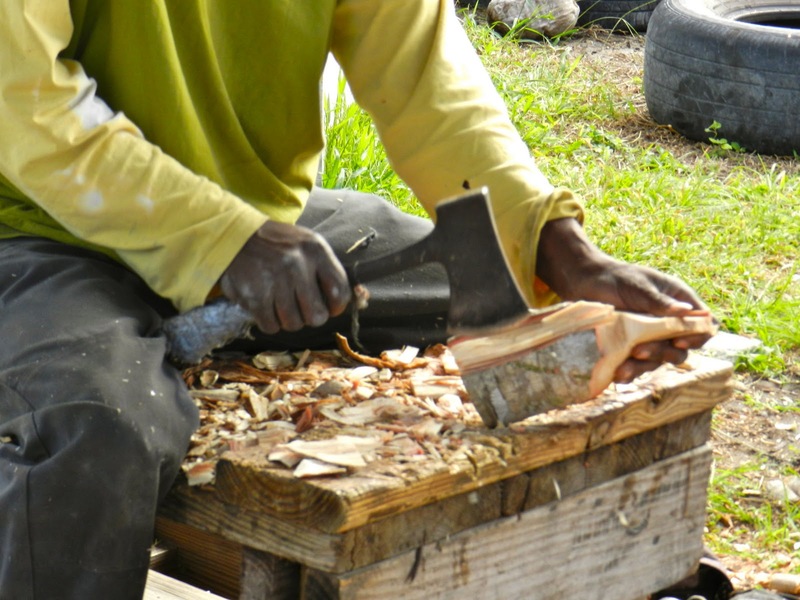 Before I went to Nassau, I learned how to carve from a cousin, Wilfred Baptist. He was the Bahama’s best, but he is not around now, and I’ve been carving for 30 years. HALLLELUJAH TRUTH: Where do you get your wood? 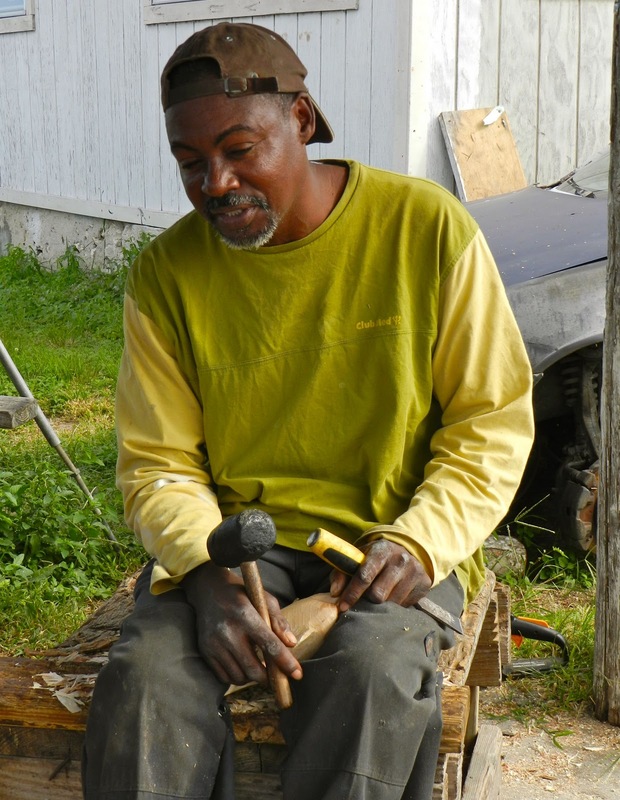 KENNY WHITFIELD: I get my wood from Sandy Point from the other side of the island. The wood is called wild tamarind, and it is native to San Salvador. You can see the dark on the outside and the light on the inside, and you can see the two–toned color. Besides it is an easy wood to work with. Just chop it down and you can carve it. Carve it while it is soft. After it’s chopped, it gets harder and harder—too hard to work with. HALLLELUJAH TRUTH: How did you develop as an artist? KENNY WHITFIELD: It came easy. After being taught in school. We had a discussion about art classes being taught in the schools of San Salvador. My understanding was that art was not included the curriculum. But Kenny said that when he was in school, there were art classes. HALLLELUJAH TRUTH: Describe what kind of art you make to sell tourists. KENNY WHITFIELD: The small gifts, turtles, owls, pelicans. I find it interesting. It’s what I love to do. Otherwise, I would be in a different job. HALLLELUJAH TRUTH: How long does it take you to carve a piece? 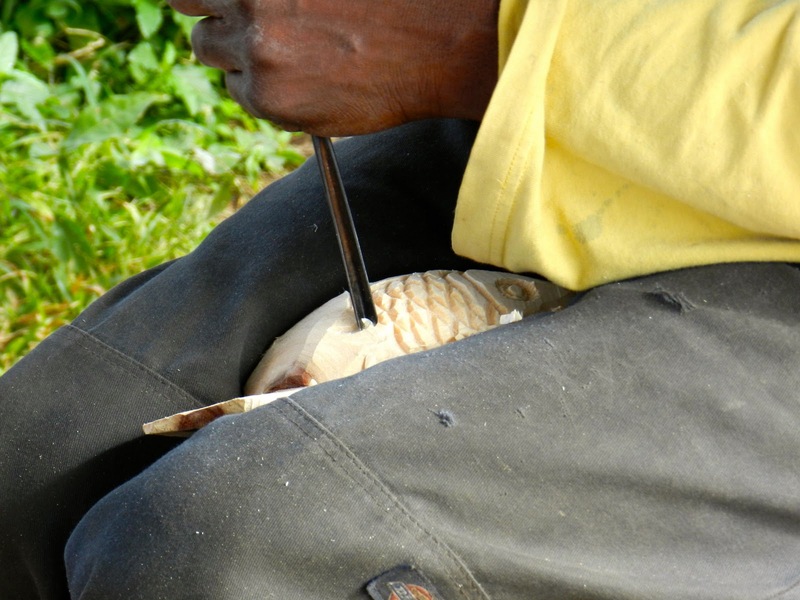 KENNY WHITFIELD: It will take an hour-an-a-half to make this grouper. Kenny refers to the piece of wood he is carving while I interview him. In fact, he finishes the grouper, a common fish around San Salvador’s coral reefs in 45 minutes! HALLLELUJAH TRUTH: Do you make art just for yourself? KENNY WHITFIELD: No. I make work to sell. HALLLELUJAH TRUTH: How does living on an island affect your art? KENNY WHITFIELD: Pretty good. No one else does it. I’m the only one. HALLLELUJAH TRUTH: Does being Bahamian influence your art? KENNY WHITFIELD: I believe so. It’s different. It is not from Taiwan, Italy, or Japan. It is made right here by hand. HALLLELUJAH TRUTH: What is nationalistic about your work? KENNY WHITFIELD: I make a lot of blue marlins, sail fishes. Basically, the majority of people like to buy stuff from the sea—9 out of 10. HALLLELUJAH TRUTH: Do you incorporate local stories in your work? Kenny shakes his head “no.” He draws my attention to his carving and explains his method. KENNY WHITFIELD: First stage is using the axe. Second stage is using the chisel to smooth it off. The third stage is to use the v-gouge to put details on. FIRST STEP. Kenny starts his carving with a hatchet. SECOND STEP. Kenny uses the chisel to refine. THIRD STEP. Kenny uses the v-gouge for detail. 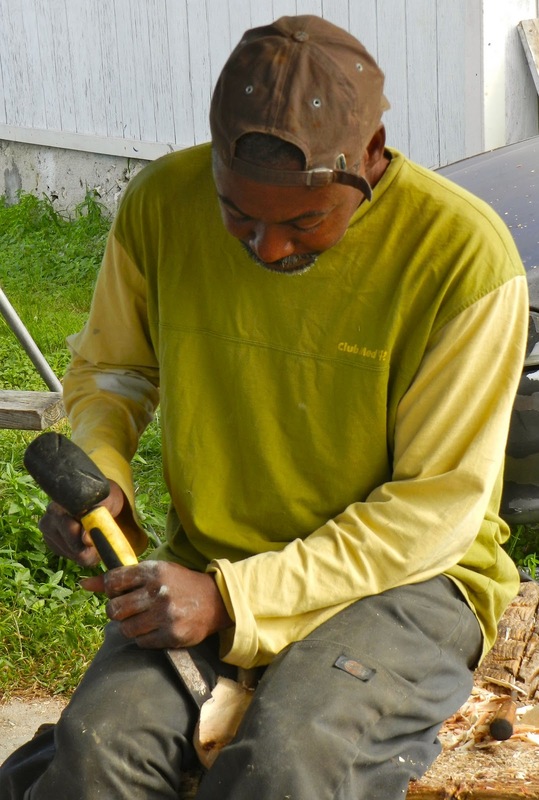 He has finished using the axe and is alternating between using the chisel and v-gouge. HALLLELUJAH TRUTH: Do you make large pieces? KENNY WHITFIELD: The majority of times I make a big piece it is just for show. Big pieces take up so much time a lot of people can’t afford it. Small pieces move on faster. HALLLELUJAH TRUTH: How many pieces do you make in a week? KENNY WHITFIELD: Twenty or thirty. It depends. HALLLELUJAH TRUTH: Who buys your wood carvings? KENNY WHITFIELD: I sell them to the field station (Gerace Research Centre), homeowners on Sandy Point. Just any tourists that come about. STUDENTS FROM THE GERACE RESEARCH CENTRE. Some professors are kind enough to stop and let their students look at Kenny's wood carvings. Out in the field, no one carries any money with them. 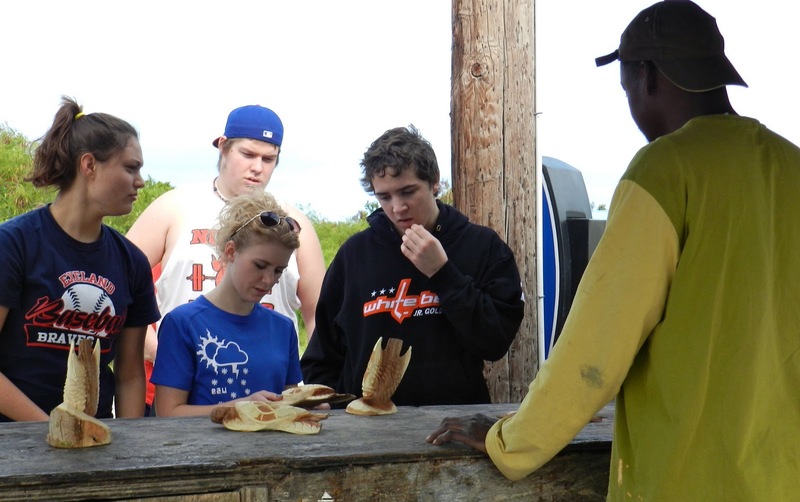 Kenny knows this and will come to the field station at some point before these students leave so they can have a chance to purchase something from him. HALLLELUJAH TRUTH: What state of mind are you in when you are carving? KENNY WHITFIELD: In a regular state. I always be feeling all right. Thinking about what I am doing. Happy about what I am doing. HALLLELUJAH TRUTH: How did you know that piece of wood was going to be a grouper? KENNY WHITFIELD: Basically, you are going to have a piece of wood that looks like a grouper, so it comes easy. That big piece looks like a turtle. Kenny points to a wide flat piece of wood. 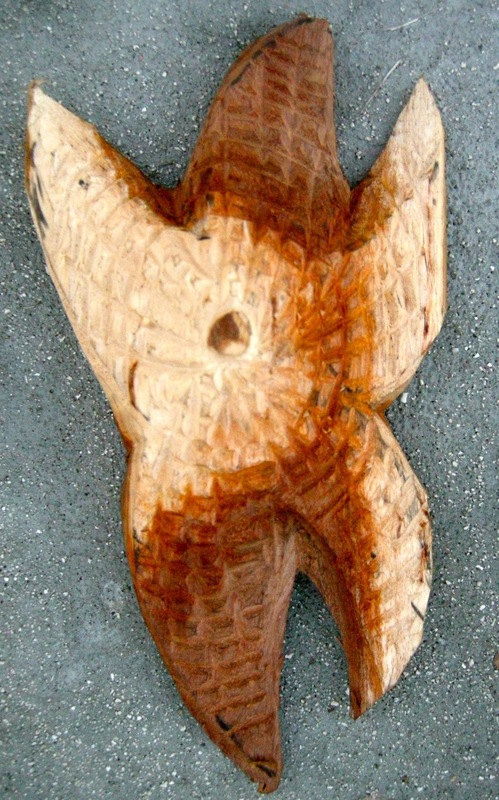 A piece of wood that is y-shaped (he points to a branching piece of wood), I will make an owl or a kissing fish. HALLLELUJAH TRUTH: Do you identify with any of the animals you carve? KENNY WHITFIELD: Cats and dogs—people normally like them. Everybody will buy a cat or dog because they are regular animals around humans. I identify with them because they are always around humans and are easy to sell. OUR INTERVIEW IN PROGRESS. Thank you Chiboogamoo for taking this as a memento for me! HALLLELUJAH TRUTH: Have you ever created something from a dream? KENNY WHITFIELD: Yeah. Last time I carved something from a dream, it was a marlin—a huge one—six or seven feet. It took me a while to finish it. HALLLELUJAH TRUTH: Where do you see your work going in the future? KENNY WHITFIELD: Actually, I see it developing and going over to the U.S. and all over the world on the Internet. I liked to do this the rest of my life as long as it keeps my head above water. HALLLELUJAH TRUTH: What’s your definition of creativity? KENNY WHITFIELD: This is what I am doing is art. Just creating for the love that the world can see. 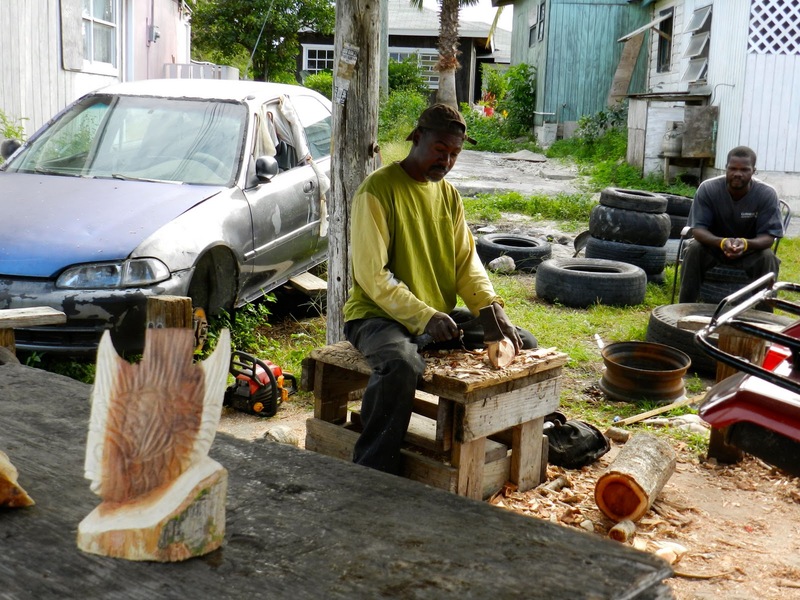 CONTACT KENNY WHITFIELD: BAHAMIAN WOOD CARVER ON SAN SALVADOR through his sister’s email. Kenny promised me that his sister is on the internet daily. REASON NUMBER ONE is restricted vehicle use: At the Gerace Research Centre on San Salvador, my husband is assigned a vehicle for Emory University class and science related activities, not for hunting down local artists. REASON NUMBER TWO is limited time: We were on a tight and challenging class schedule in order to visit the numerous various coral reefs, lagoon, and outcrops that Chiboogamoo wanted his Emory students to see. There was no “free” time for non-science related activities. REASON NUMBER THREE is no direct line of communication. We did not have a phone number or phone to agree on an established time to meet with Kenny Whitfield. We were to rely on either word of mouth (telling employees at the Gerace Research Centre to tell Kenny we wanted to see him) or chance (he might just be at his open air studio if we were driving by and had time to visit him). 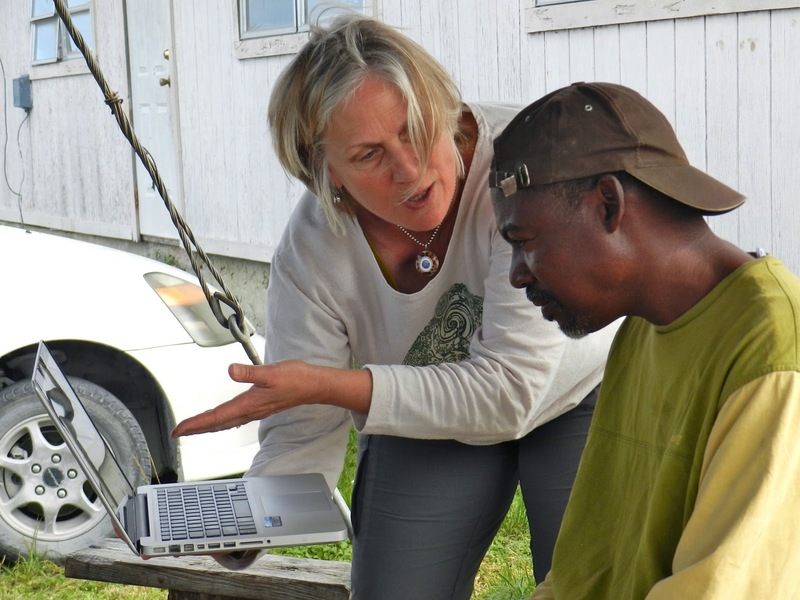 ACKNOWLEDMENTS: Thanks to Thomas Rothfus, executive director of the Gerace Research Centre, for allowing local artisans to bring their work to the field station. I am very grateful to the generosity of Kenny Whitfield, who was happy to be interviewed and answered my questions forthrightly. Great appreciation goes to my Chiboogamoo, who supports my interests in the arts no matter where we are, no matter how tight is his “scientific” schedule. Without his sincere cooperation and excellent photography skills this interview would not have taken place! You are a generous artist,Ruth,sharing Kenny Whitfield's artwork with us. It's awesome! Dear Shelley, thank you so much for sharing your experience on San Sal with Kenny Whitfield! 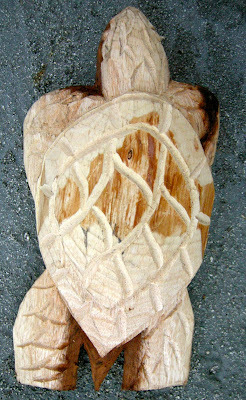 I am so happy that my interview with Kenny led you to getting the carved turtle you wanted! San Sal is a magical place. Kenny is an intuitive carver. You are a very kind person! Hallelujah! I am currently working on populating the Bahamas Geotourism website (www.bahamasgeotourism.com) points of interest directory with descriptions and photos. 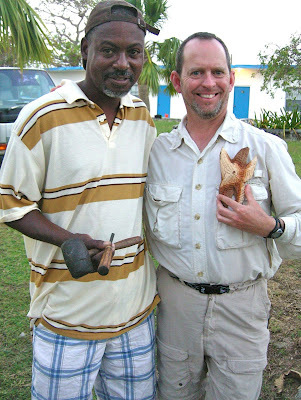 Do you mind if we use photos from your site here http://coffeewithhallelujah.blogspot.com/2012/01/bahamian-master-wood-carver-kenny.html of Kenny Whitfield? Of course you will be credited, just let me know which name to put on the credits. Nikia Brice, my husband and I are so pleased you would like to use our photos. All of the photos were taken by Anthony Martin unless indicated. Thank you for acting so ethically and asking to use them and giving appropriate credit.